NASA's Juno spacecraft, bound for Jupiter, passed a milestone on January 13 when it reached a distance of 493 million miles from the sun. That's about five times the distance between the Earth and sun. The distance by itself is not the milestone, since numerous spacecraft have ventured far beyond this. 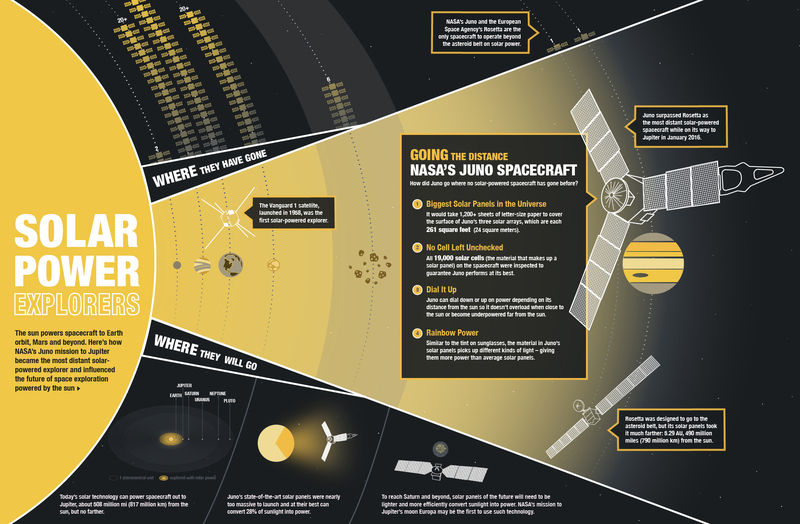 The news is that Juno is powered by sunlight, a sparse commodity out in Jupiter's realm--a sort of "twilight zone" for spacecraft that depend on sunshine! The 8,000-pound Juno was launched in 2011 on a mission to explore the planet Jupiter in greater detail than previous spacecraft, including the gas giant's composition, gravity, global magnetic field, and in particular the magnetic field in Jupiter's polar regions, even probing the properties of its interior. 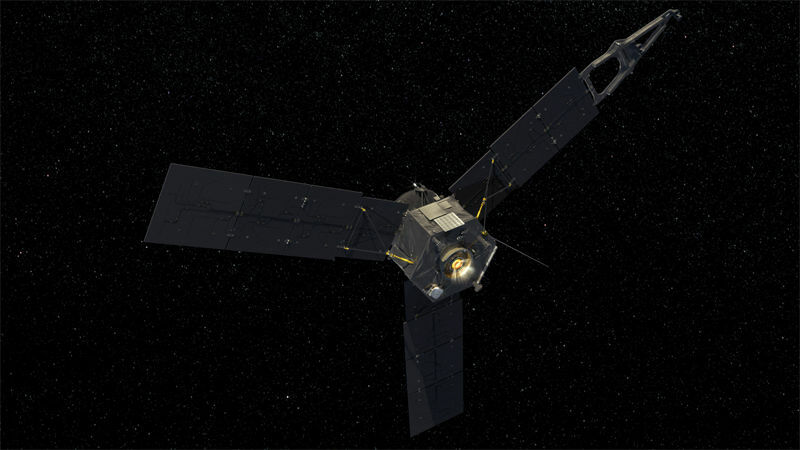 Before Juno, the record-holder was the European Rosetta spacecraft. 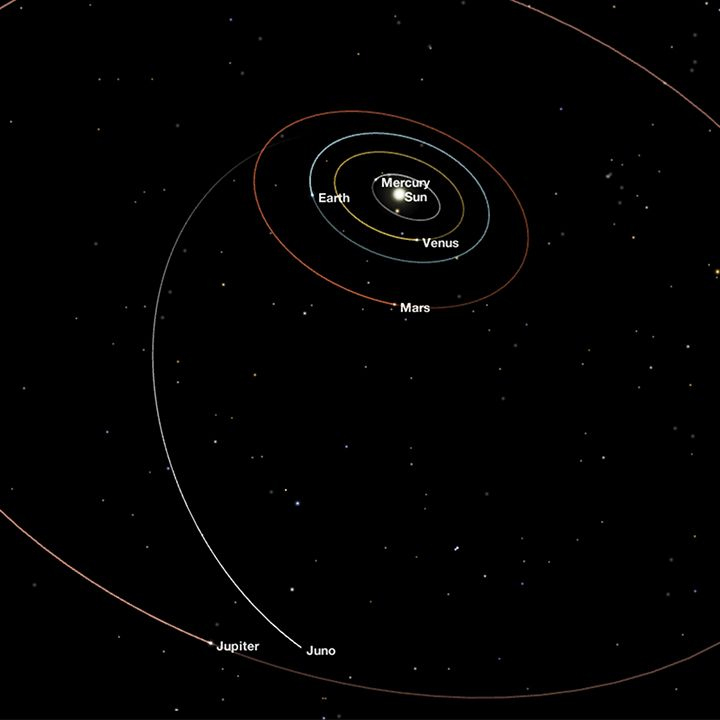 Rosetta cruised in hibernation mode through its orbital aphelion (its most distant point from the sun) back in 2012. Later it fell sunward toward its encounter with comet Churyumov-Gerasimenko. Within the inner solar system, from the planet Mercury out into the Main Asteroid Belt between the orbits of Mars and Jupiter, robotic exploration is powered almost entirely by photovoltaics—solar cells. In fact, solar photovoltaic technology was developed for Earth-orbiting satellites. Notable exceptions include short-lived probes dropped to the surface of Venus, which were powered by chemical batteries, and NASA's Curiosity rover on Mars, which requires the kick of nuclear power to drive its equipment. Near the sun, sunlight is intense enough to make photovoltaic power practical. At Earth's distance, sunlight intensity amounts to over a thousand Watts per square meter. A reasonably sized array of solar panels can generate a practical amount of electrical power for a satellite or spacecraft, even though the technology is not 100 percent efficient. But the farther a spacecraft gets from the sun, the weaker the sunlight becomes, by a factor of the square of the distance. Jupiter is five times farther from the sun than Earth, so sunlight at that distance is weaker by a factor of five-squared, or 25. Juno's photovoltaic system consists of three, 30-foot-long panels, which at Earth would generate up to 14,000 Watts of electrical power. At Jupiter where Juno is now approaching, that solar array generates a mere 500 Watts! But, it will be enough to power the efficiently-designed Juno as it probes Jupiter's interior, atmosphere and magnetic field. Most missions sent beyond the Main Asteroid Belt are nuclear-powered. NASA's Galileo, the only other spacecraft to orbit Jupiter, was powered by two radioisotope thermoelectric generators (RTGs) that produced about 570 Watts of electrical power by converting the heat of decaying radioactive material into electricity. If you've seen the movie, "The Martian," you may recall Matt Damon's character digging up a device to keep the cab of his rover warm—that was an RTG. At the time of the Galileo probe, photovoltaic technology wasn't advanced enough to be a practical power source. The spacecraft would have needed at least 700 square feet of solar panels to function! Beyond Jupiter, solar-powered spacecraft will likely remain impractical for a long time to come. As sunlight becomes weaker, spacecraft simply need larger collection surfaces to squeeze out energy from sparser photons. At Saturn, where NASA's Cassini spacecraft has been operating on RTG power for about 12 years now, sunlight is 90 times weaker than at Earth—almost four times weaker than at Jupiter! The Pioneers, Voyagers, and New Horizons range even farther, in the cold darkness well beyond Neptune's orbit, where the sunlight trickles in at one-nine-hundredth the strength of Earth-side sunshine. Juno will arrive at Jupiter this July, to begin the one-year science phase of its mission, after a five-year voyage to get there. At the conclusion of its mission, the spacecraft will be de-orbited to burn up in Jupiter's atmosphere, following in the fiery footsteps of its predecessor, the Galileo probe.